Construction forms, hardware stores, retail stores, spa centers, hair salons—almost all types of businesses can benefit from attracting the attention of potential customers. You can achieve this by providing them a well-structured and comprehensive list of the type of products or services that their companies provide, as well as its concurrent prices, and discounts (if there are any). 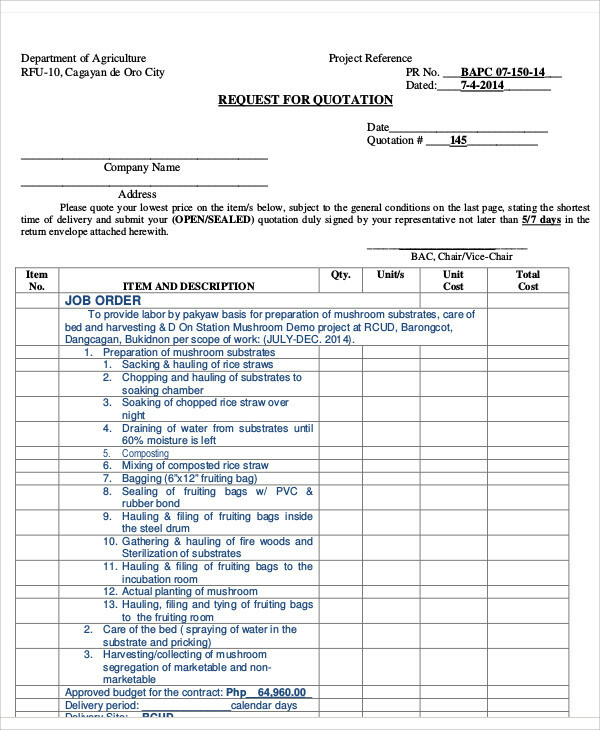 Whether you are a manager of a construction firm, a retail supervisor, or any type of business owner, you need to create a quotation proposal which can attract potential buyers and customers and move them to avail your products and/or services. 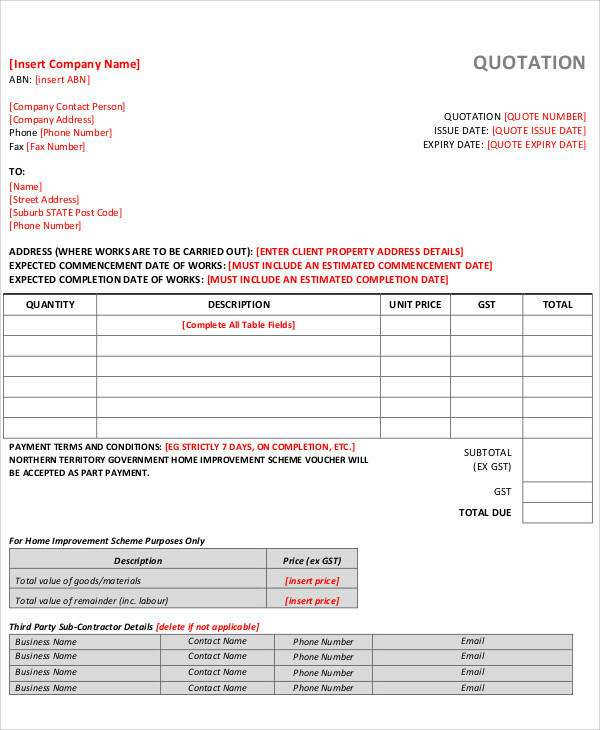 To help guide you in the creation of your quotation proposal, we are providing you with easily downloadable Sample Quotation Forms. 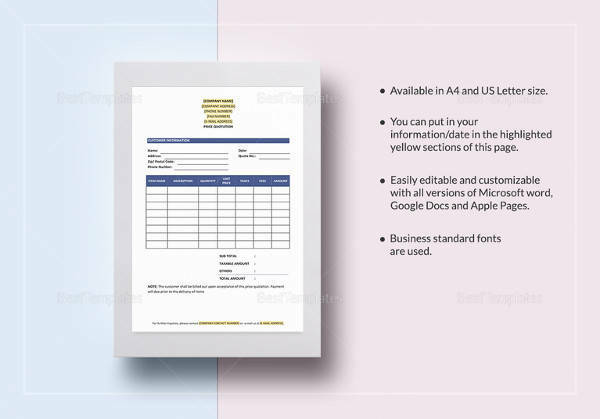 These templates are very easy to edit and these are available in both PDF and Word formats thus making it easier to store on and access your devices. 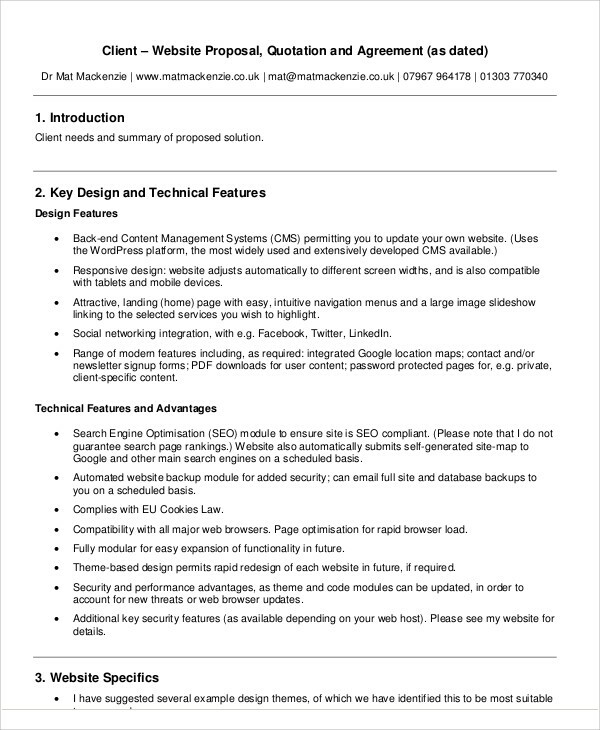 Scroll down below to view our helpful templates! 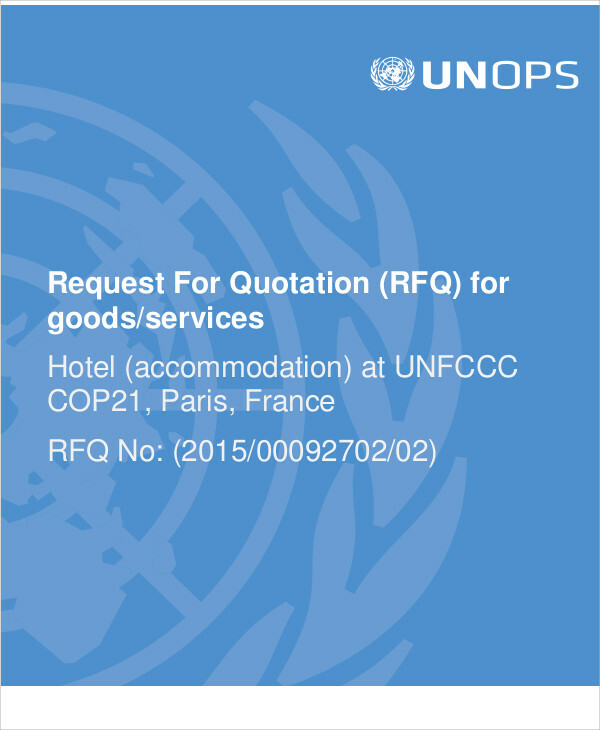 Quotations are otherwise known as quotation proposals. 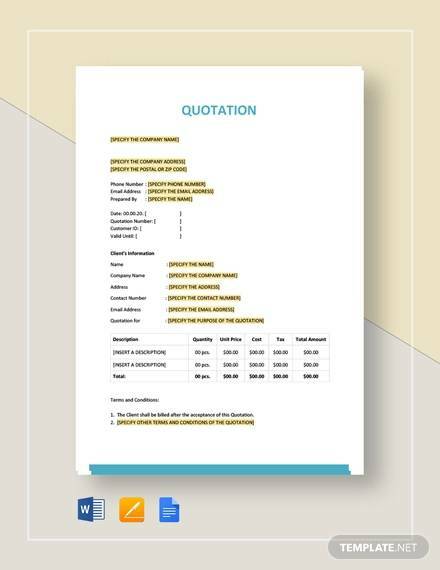 Quotation proposals are documents which contain the estimation of prices of particular products, materials, or services which a business is offering to a certain potential customer. 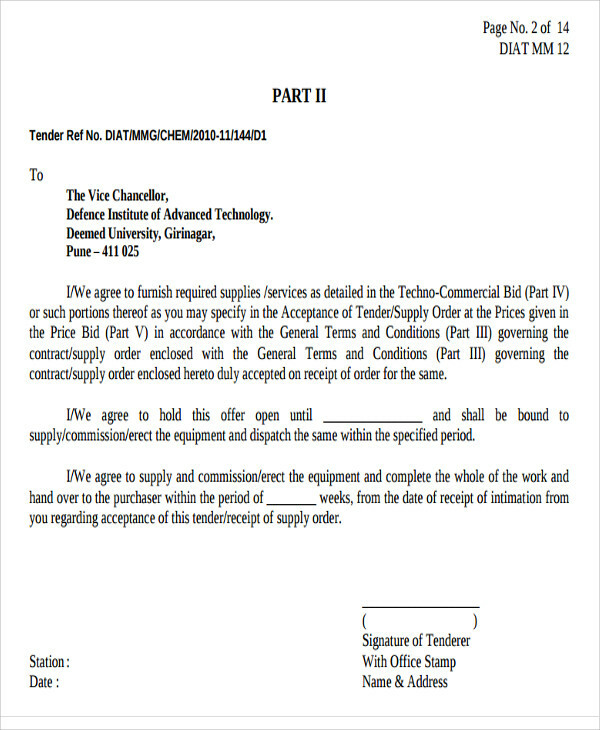 The submission of a sales quotation by a company or supplier to a potential customer would provide the companies an avenue to discuss with potential customers or buyers regarding the types of materials that they can use, the delivery specifics, and other necessary aspects of a business transaction. 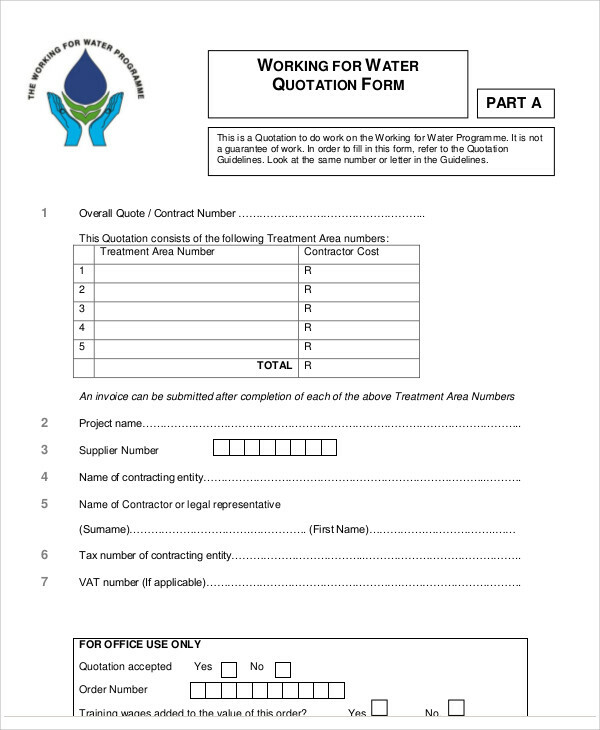 A quotation proposal, therefore, can encourage the potential customer’s willingness to buy or avail the products or services of a business because they are given the chance to negotiate the price of the products/services, the quantity, the quality of the products, the terms of payment, delivery specifics, and other negotiable aspects of a business transaction. 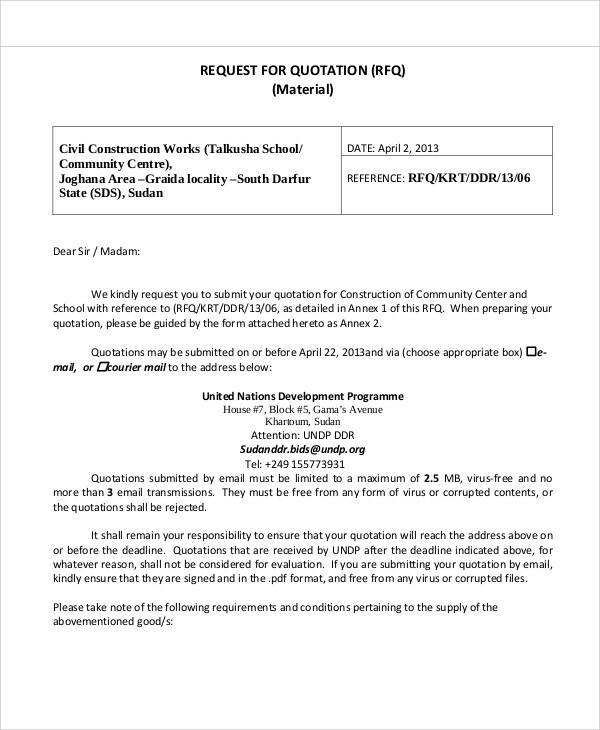 Who Can Prepare a Quotation? He/she must be familiar with all the services and products being offered by the company and for which he/she is preparing the quotation. He/she must be well-informed of the price fluctuations of their products and services. He/she must be capable of conducting research regarding the prices offered by competitors for the same products or services. 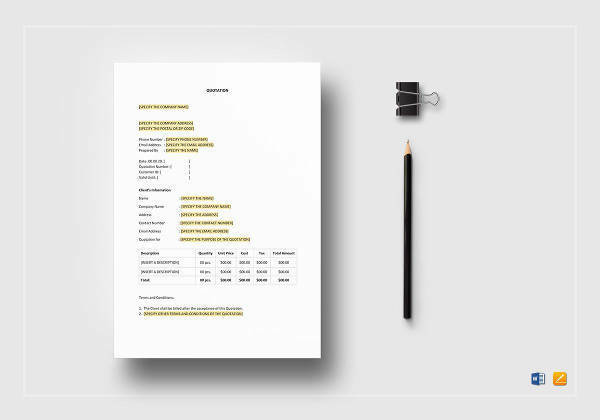 He/she must be able to adjust the prices in the quotation proposal in a way that the business can still gain profit while maintaining it at a level that is still affordable for the potential customers to actually decide to agree to such prices. 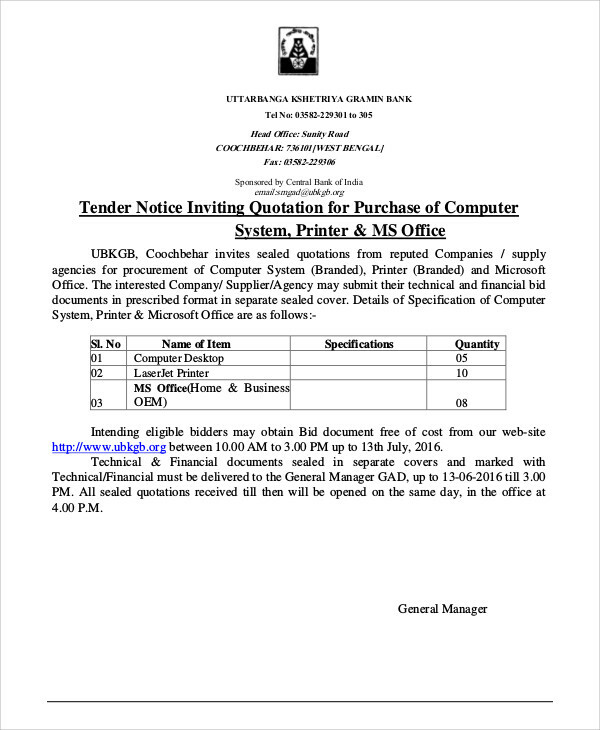 He/she must have good interpersonal skills in dealing with potential customers/buyers, suppliers, and other bidders. 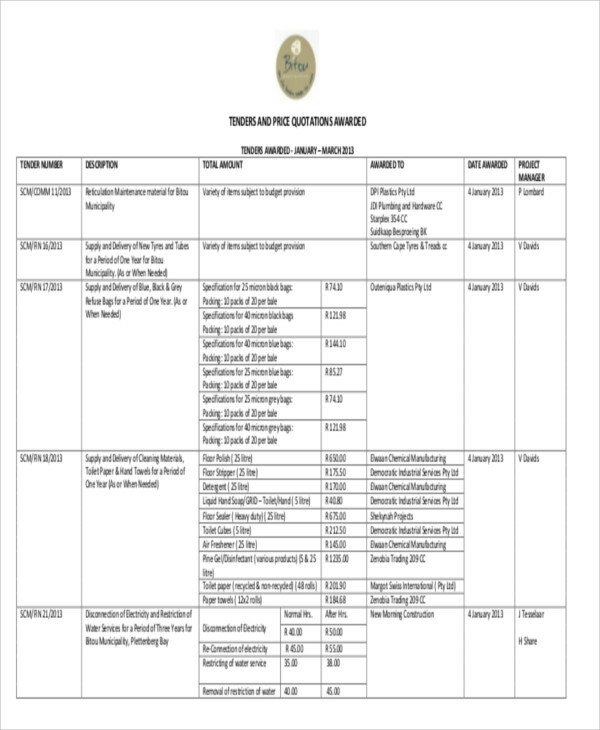 He/she must be keen in knowing the latest bidding events which his/her company can take a part of. There is still a variety of attributes or skills which a person preparing a quotation must possess. However, the ones mentioned above are the most crucial or important ones. 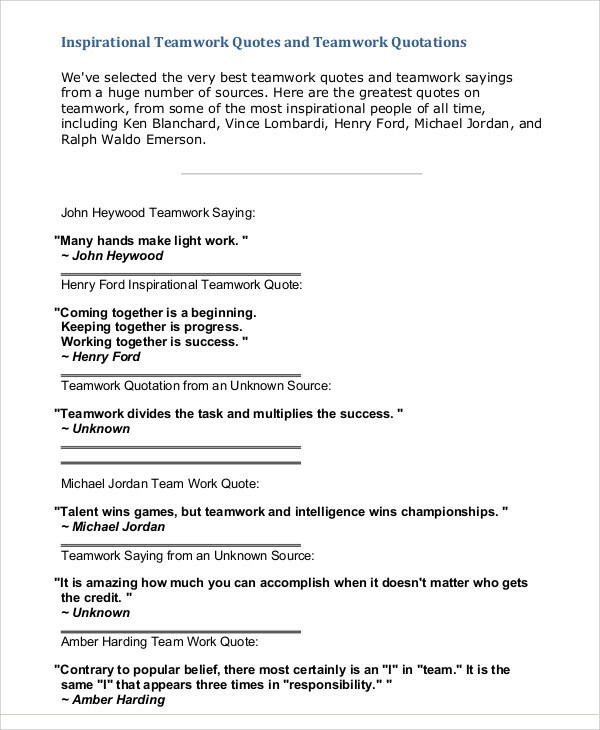 What Are the Essential Elements of a Quotation? 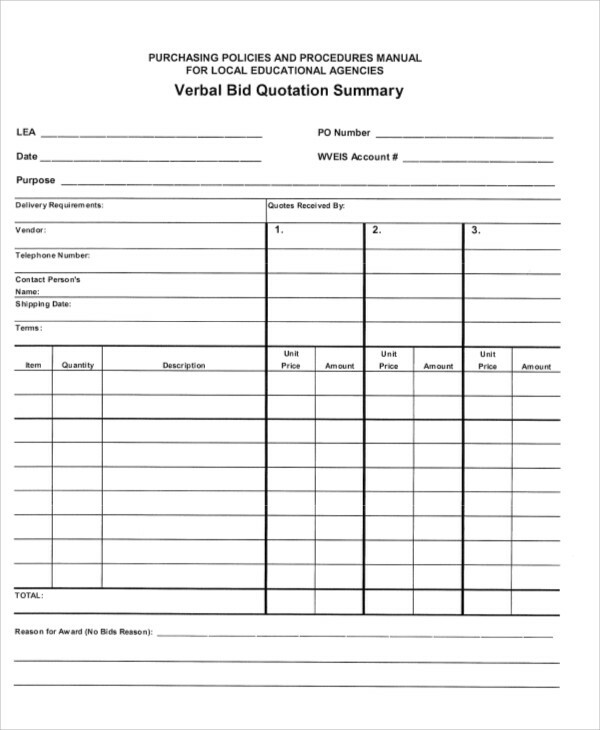 Quotations are used when there is an official bidding event which necessarily obligates the bidding companies to bring a quotation proposal during the bidding event or process. 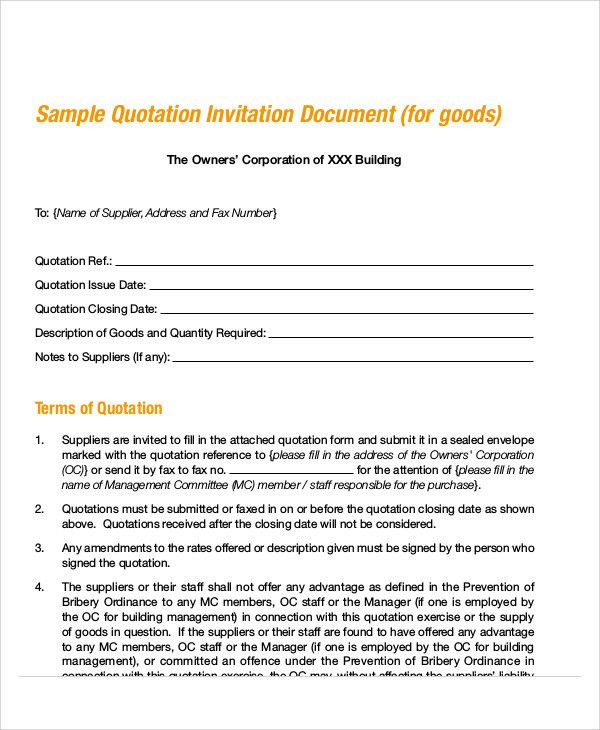 Quotations are used when businesses are companies voluntarily submits their quotation without an invitation to do so. 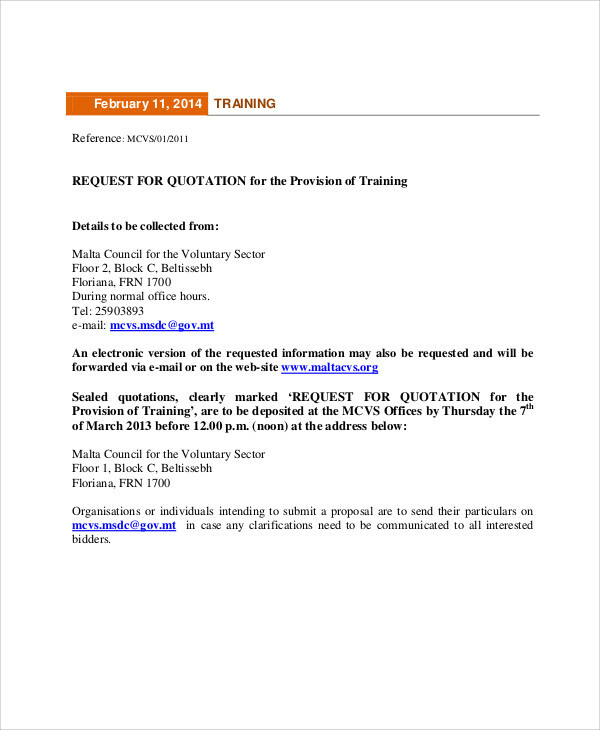 Quotations are used when businesses or companies are asked or invited by a bidding committee or by a potential buyer to submit a quotation proposal. 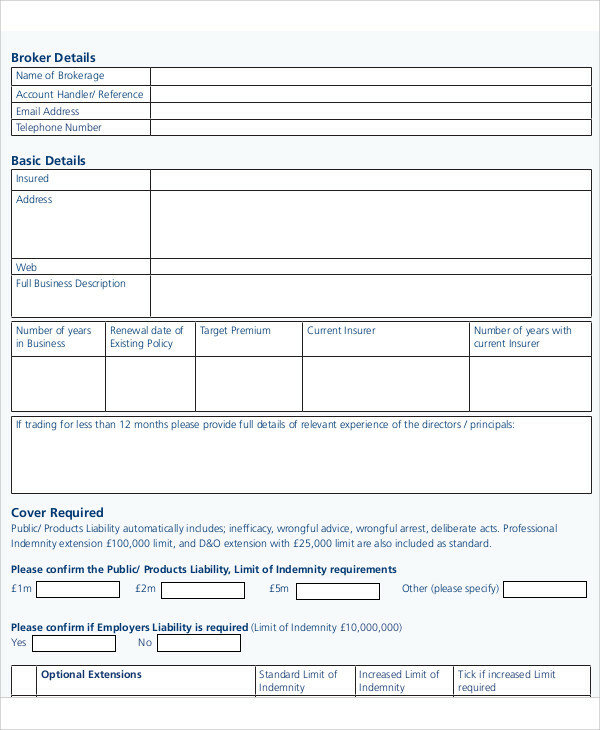 Do you want a more generic layout for quotation proposals? 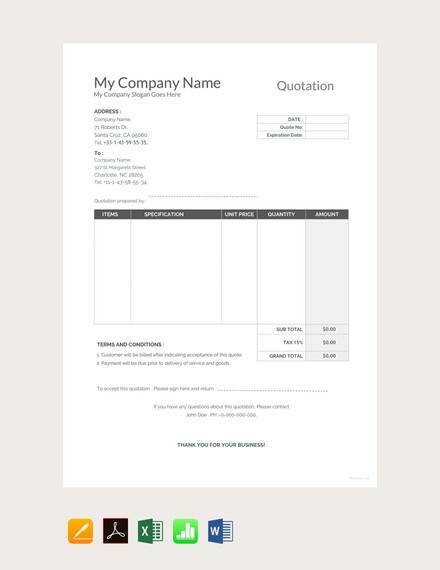 You can check out our collection of Sample Standard Quotations which contain standard templates for quotation proposals. 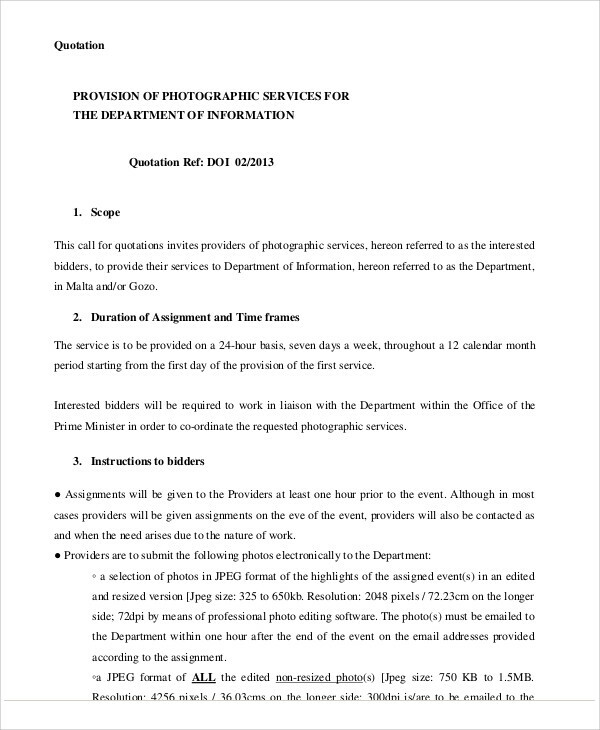 You may access these templates by clicking on the link provided. It attracts potential buyers at a bidding event. 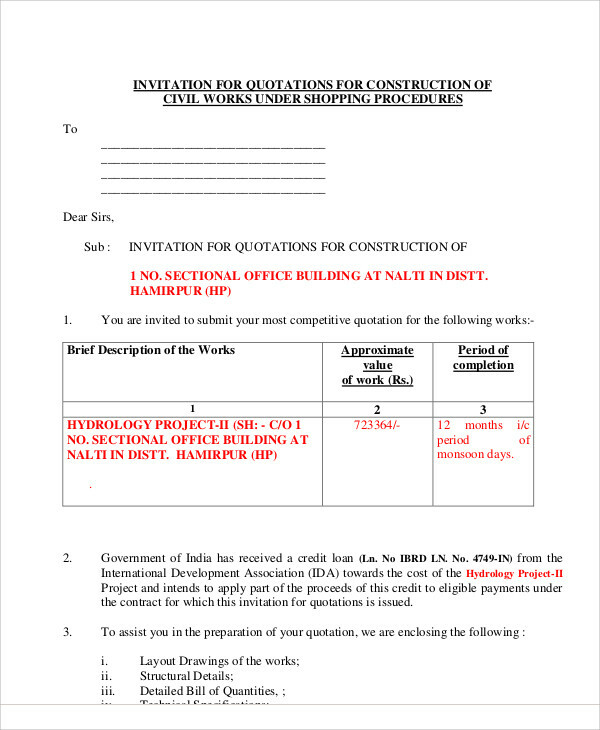 Large projects such as the construction of establishments and buildings are the most typical reasons for the creation of a quotation proposal. This is due to the fact that projects entail a massive amount of purchasing or availing of various services. Usually, potential buyers want to acquire the cheapest items without compromising the quality of the products/services. It is for this reason that a bidding is held in order for them to assess which potential supplier can best provide them with their needs. 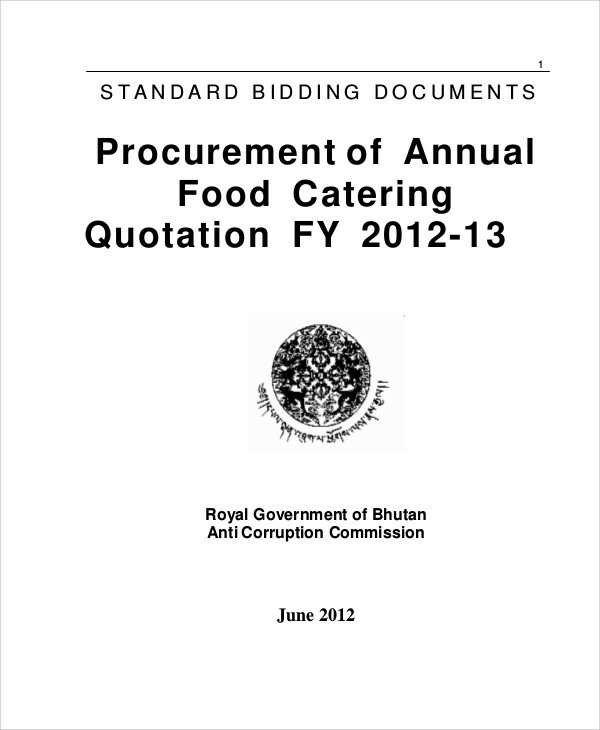 Upon bidding, the potential suppliers would provide the potential buyer with a quotation proposal or a sales quotation. A potential supplier’s chances of getting chosen would be increased if he/she would make his/her price offers affordable. It gives customers the chance to negotiate the prices of the products or services. A quotation proposal is not final, It allows potential buyers to haggle down the price. 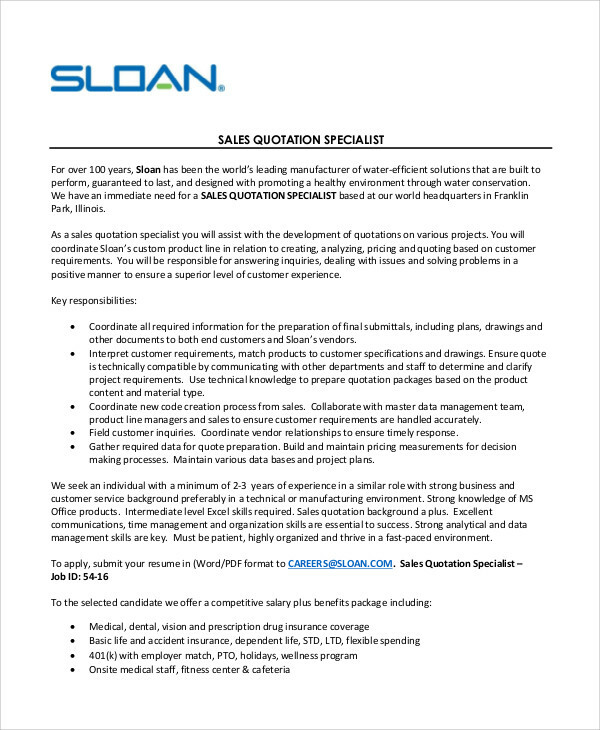 Since a quotation proposal does not give rise to the legally binding sales contract, a potential supplier may choose to acquiesce to the potential buyer’s price preferences. Also, potential suppliers would have enough time to consider buying from other distributors in order to avail of cheaper products which can be sold at a price which the potential buyer agrees to. 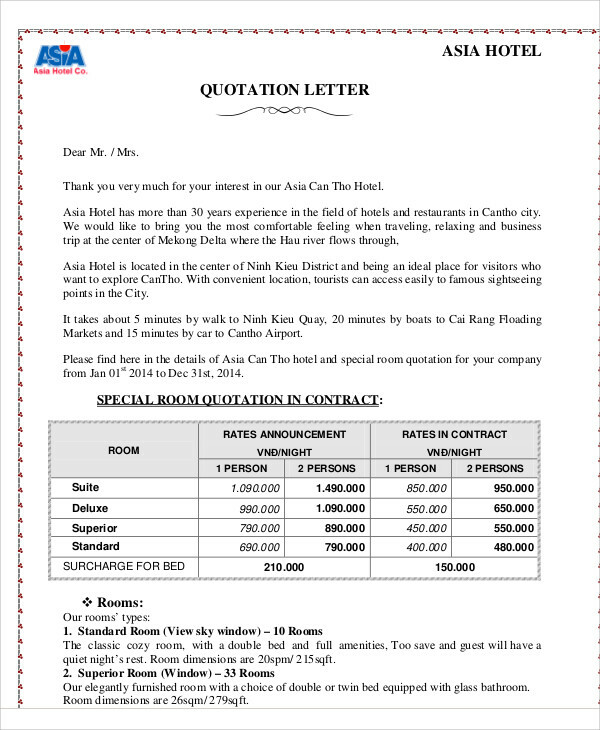 In this way, both the potential supplier and potential customer would be satisfied. It allows customers to ask for adjustments regarding the specifics of purchasing, such as time of delivery, the mode of payment, and etc. 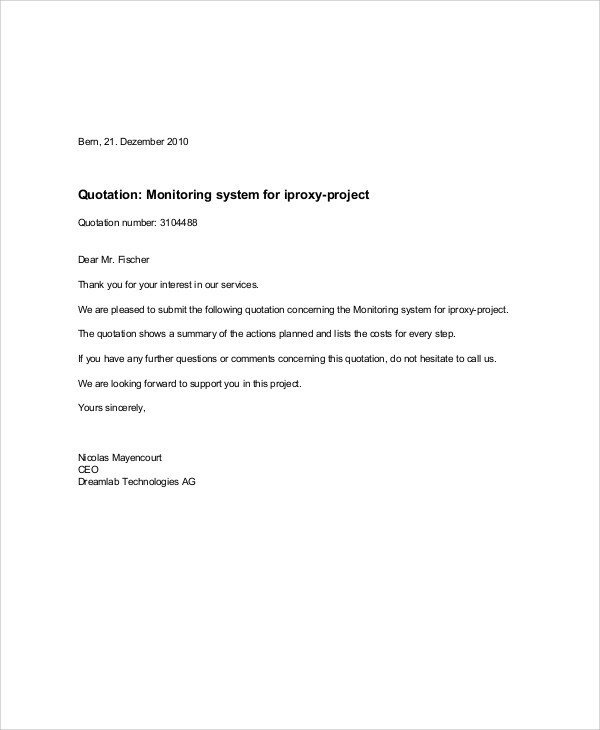 Another benefit of sending a quotation proposal is the fact that the customers have more options when it comes to the specific materials that can be used for the project as well as the terms of payment and mode of delivery that they prefer. 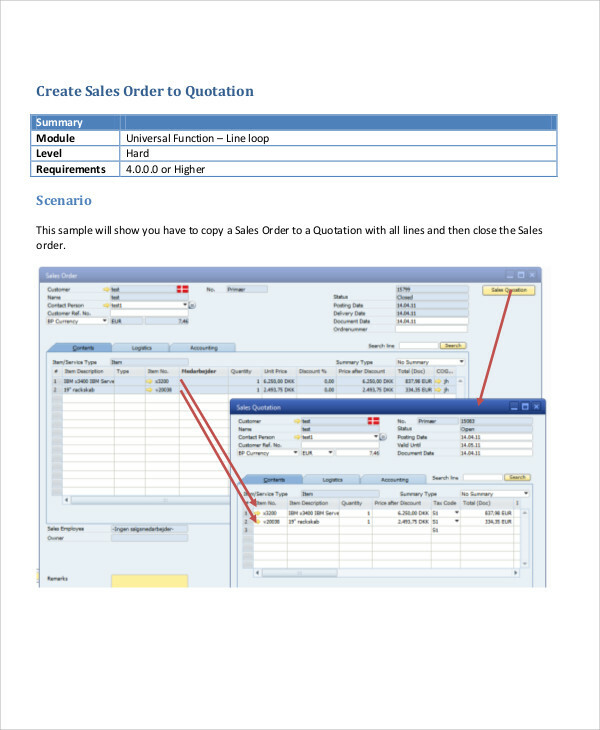 In this manner, therefore, a sales quotation serves as the pre-sales contract negotiations. It allows the business owners or business analysts to analyze the customer-buying trends. The best way to gauge the capacities of existing and potential customers to purchase a particular product is through the quotation proposals. It can be assessed with the level of willingness the customers portray in purchasing a product or availing a service with little to no haggling of its price/s. It is important for businesses to invest in products or services which are still relevant to the needs of the market. Otherwise, when a business is still offering massive amounts of items which are no longer useful or relevant, surely, such business would suffer a certain amount of financial loss. 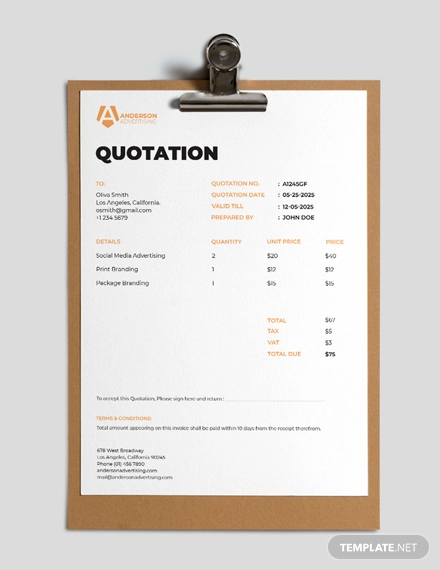 Aside from the quotation templates on this page, you can also check out our collection of Price Quotation Samples. 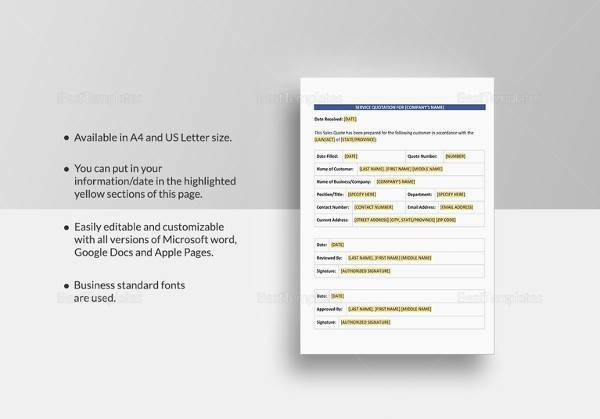 This collection contains templates that are available for download. You may access these templates by clicking on the link provided. 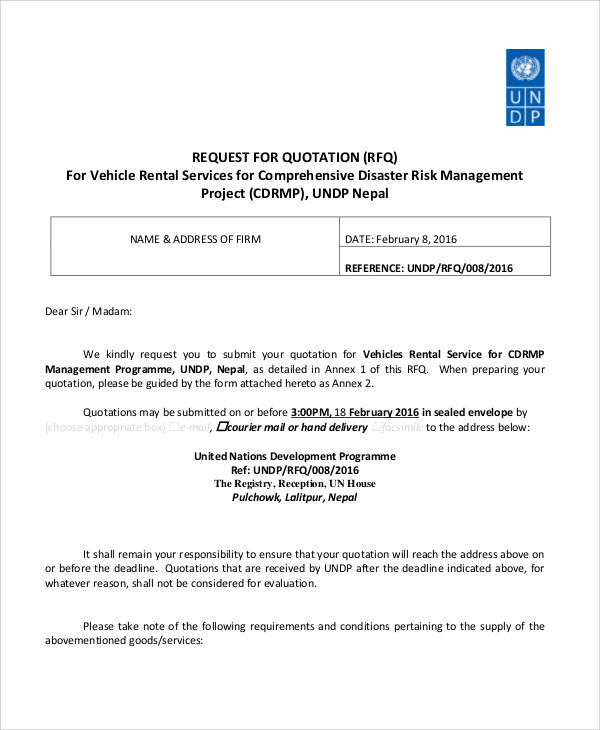 Quotation proposals can have various forms depending on the type of services or products which it is advertising. Also, the nature of the business and the project to which such proposal is made for play a crucial role in the preparation of quotation proposal. 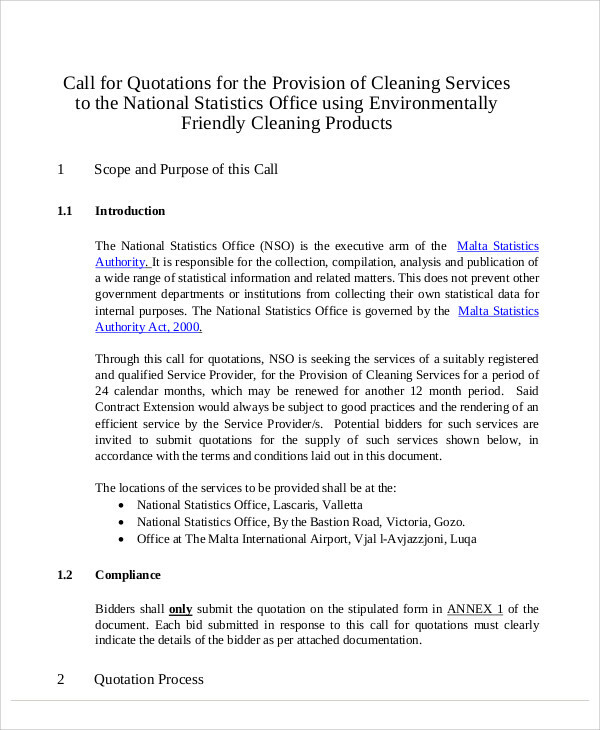 On this page are examples of commonly prepared quotation proposals. 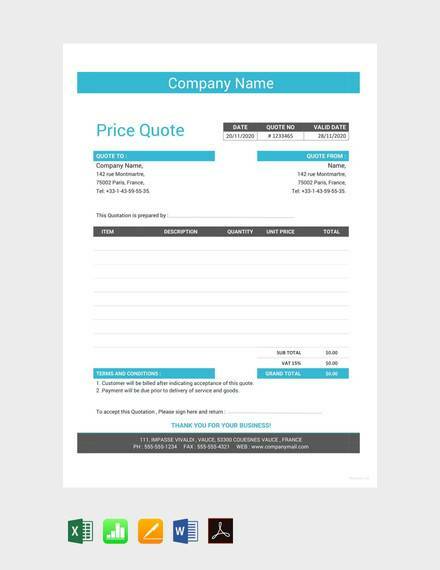 Feel free to download our quotation templates. 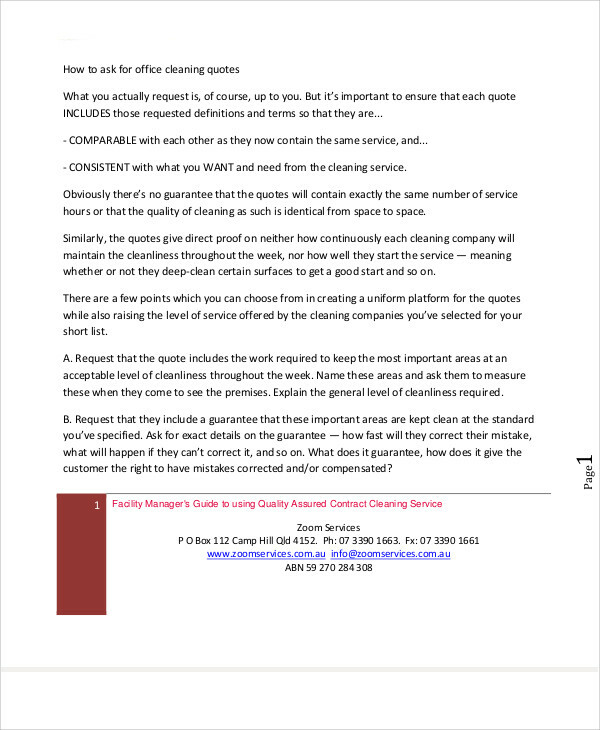 Service quotations are used by companies or business which offer services to their customers. Services can vary from plumbing and car repair, to the construction of buildings. 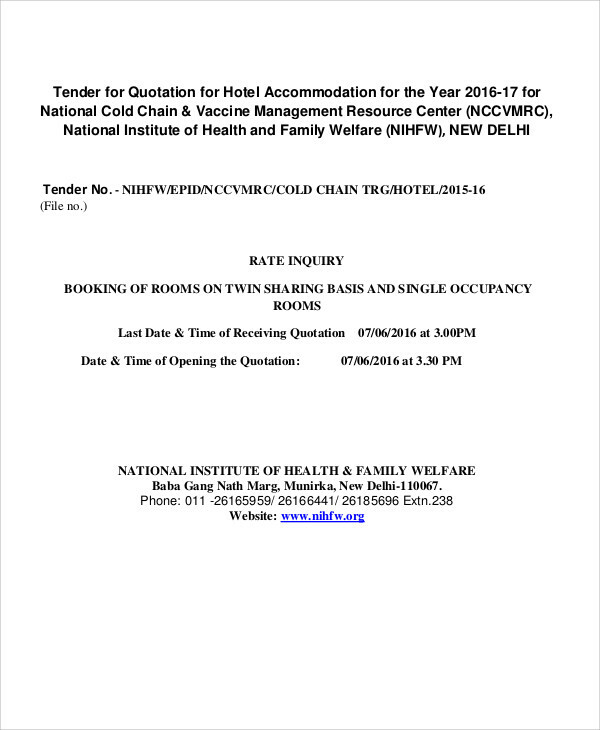 The most prominent aspect of service quotations which differs from that of the standard quotation is that it provides the types of services instead of products which can be purchased. 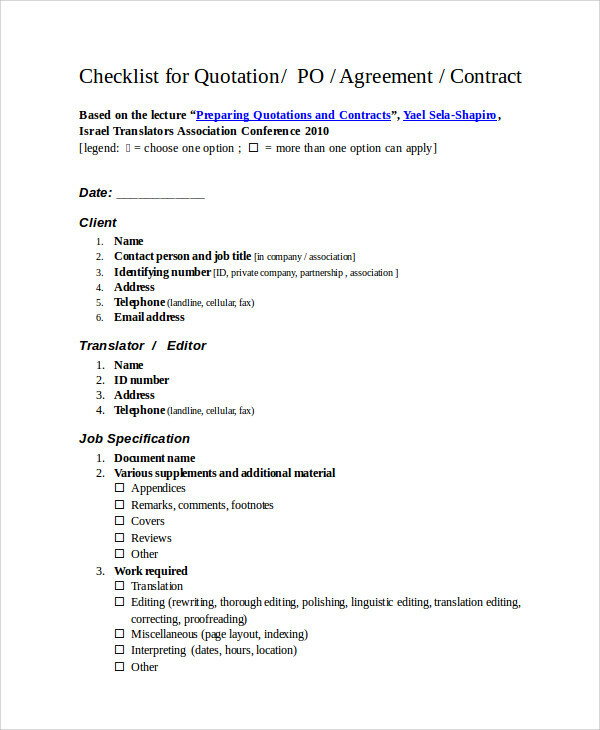 Furthermore, a service quotation is more intricate compared to other types of quotation proposals since business associates or sales associates must prepare it in such a way that the products (if any) which are used in the performance of services can suit the potential customers’ preference of the products and equipment to be used. For example, if your company is offering car repair services and your client’s car requires that you replace a car part with a new one. In such a case, you can give your client the option regarding the car part’s quality. Oftentimes, high-quality materials equate to more expensive or higher prices. 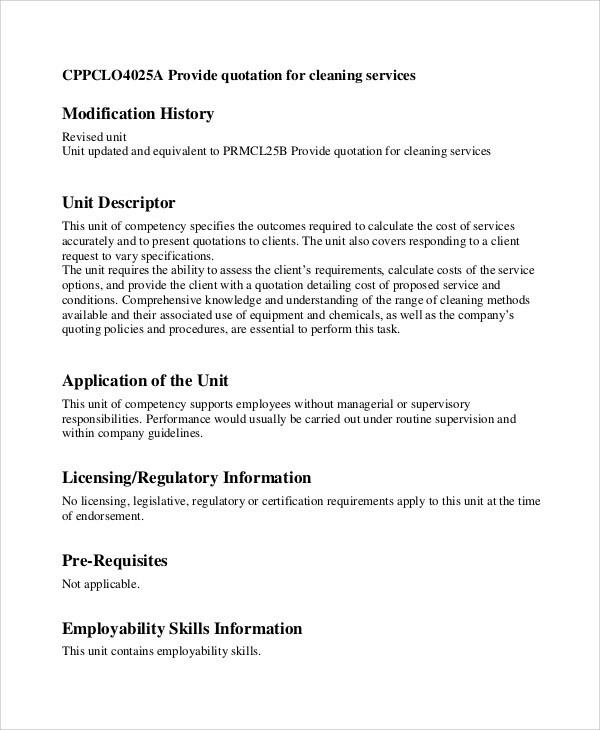 That’s why, in service quotations, you have to provide a list containing the options which your client can choose from regarding the tools or materials to be used during the performance of the service. 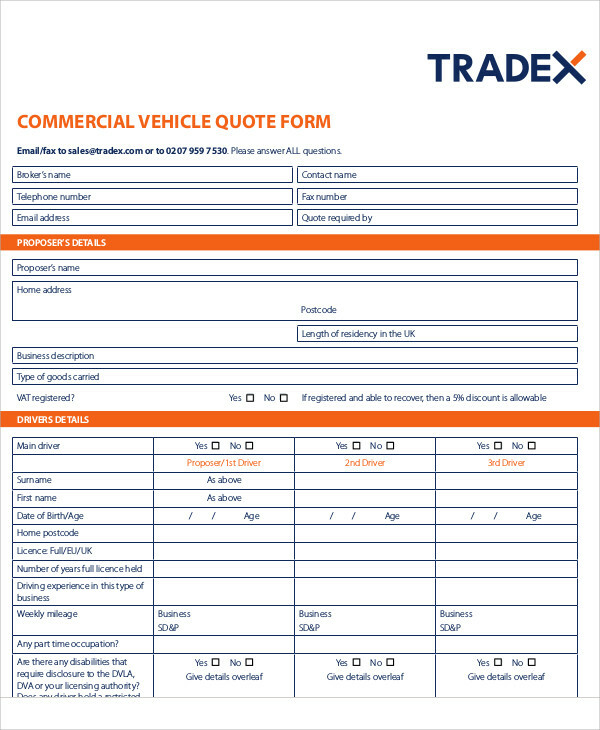 If you want to learn more about the various sub-types of service quotations, feel free to check out our collection of Service Quotation Samples. 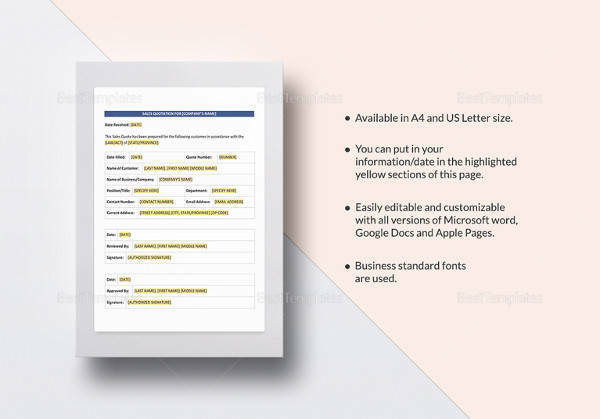 They contain easily downloadable templates. 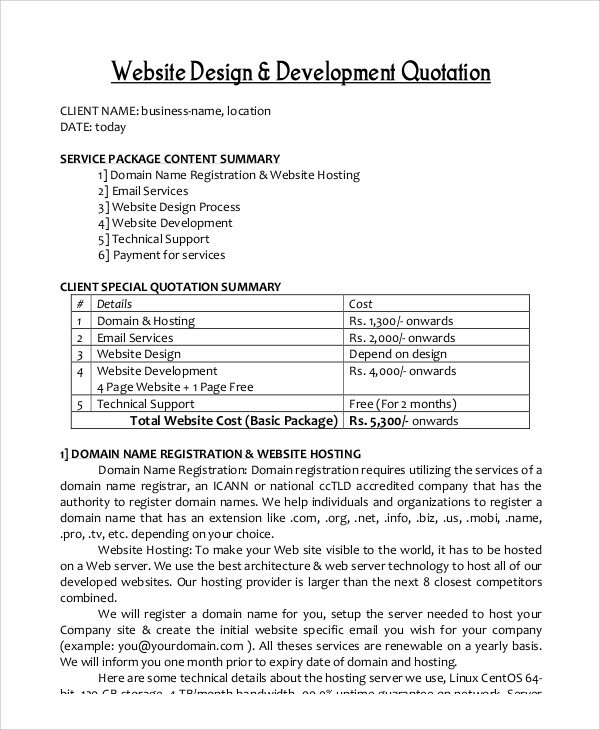 The said templates are designed in such a way that it can cater to various types of service-providing businesses or companies. 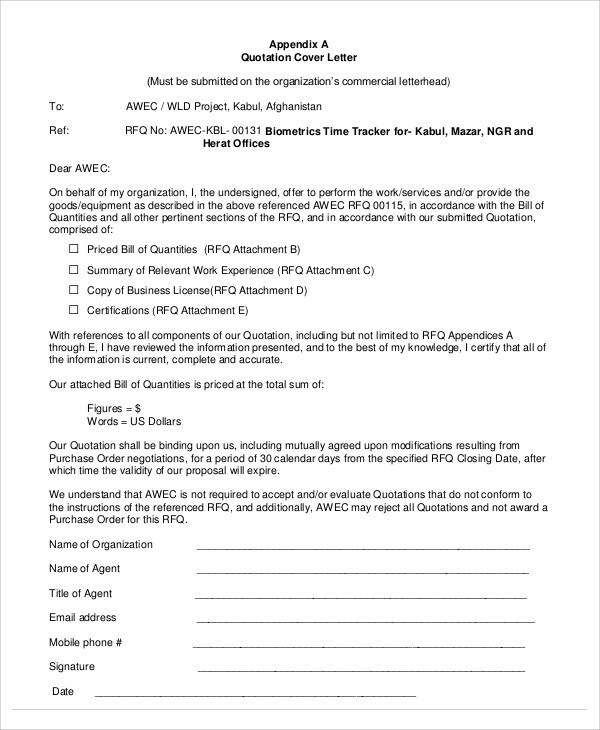 You may access these templates by clicking on the link provided. 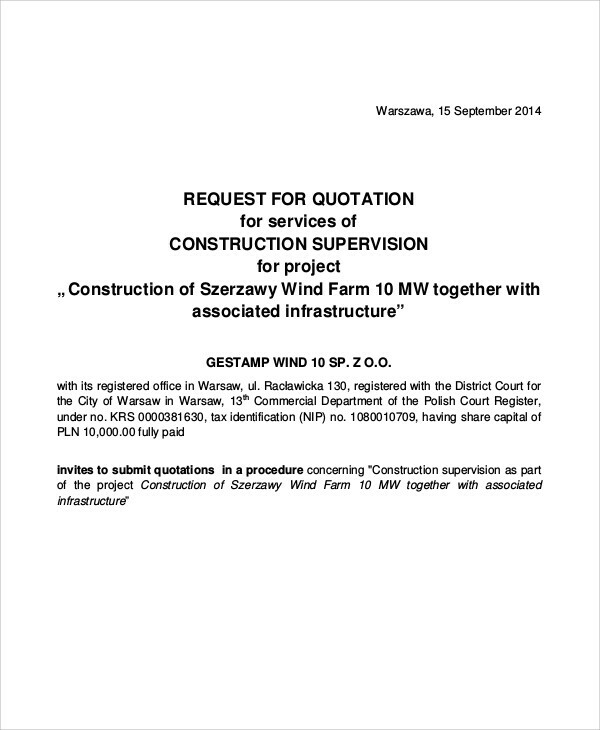 Construction quotation proposals are crucial to the construction industry. Building specific establishments necessarily requires a lot of construction materials in order for the said establishment to take form. 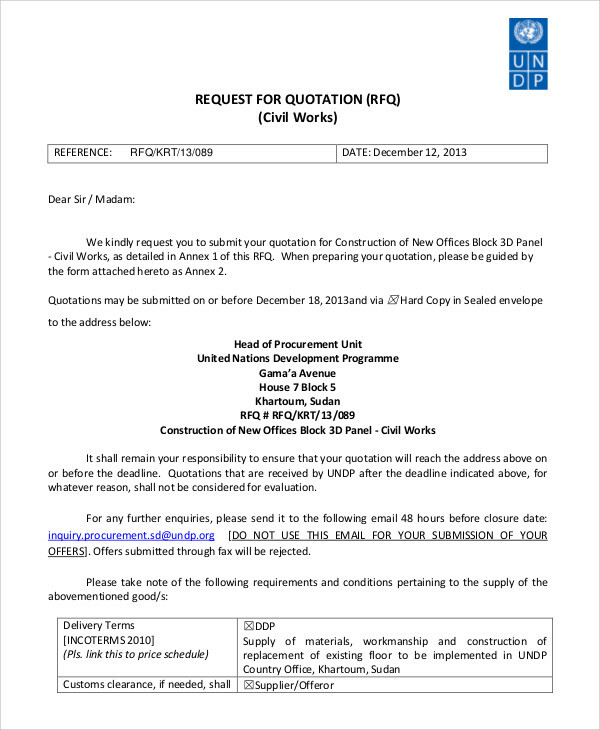 Due to the immense number of materials needed in construction projects, most builders or construction managers require hardware stores or any construction materials suppliers to prepare construction quotation proposals. 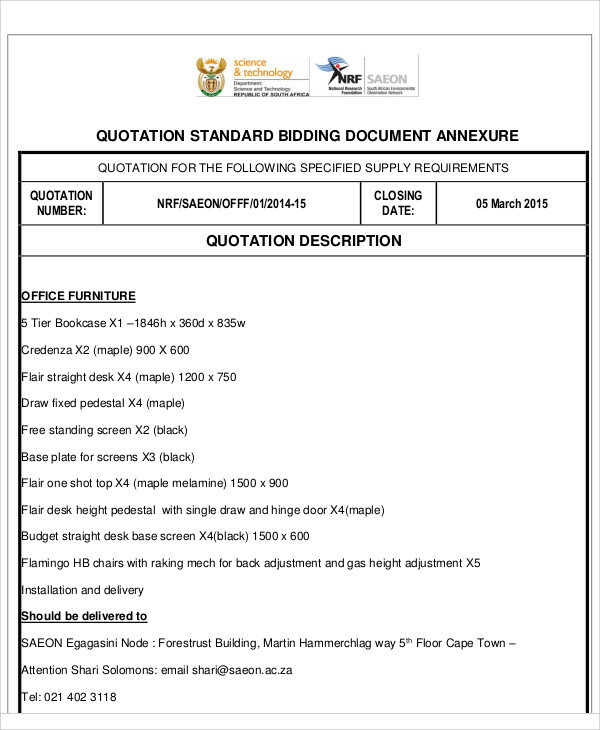 Afterward, when all the potential suppliers have prepared their construction quotations, the bidding process begins. During the bidding process, several bidders submit their quotations, after which the potential buyers would make suggestions pertaining the type of materials they want, quantity, brands, and the specific prices that they prefer. Normally, potential buyers seek the most affordable and least expensive price quotations. 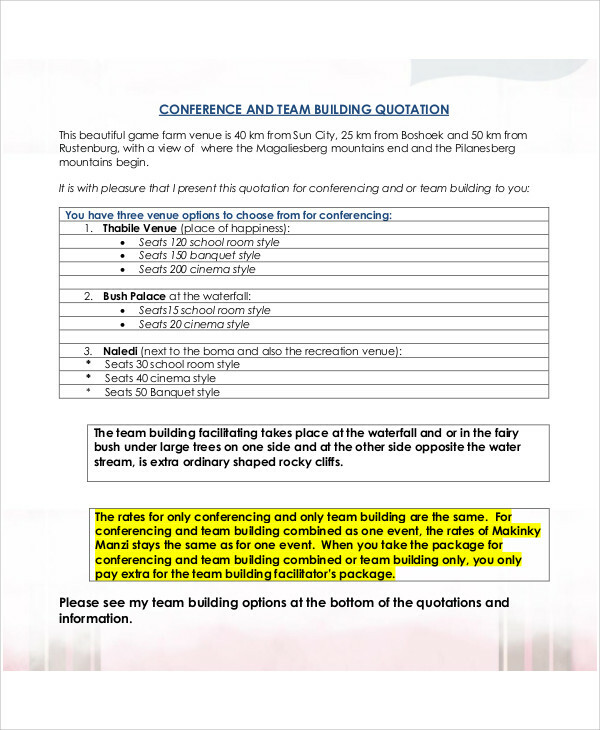 That is why, at the bidding stage, the potential supplier may choose to adjust the prices in his/her construction quotation. In this case, a potential supplier can have a wider chance of getting chosen as the construction materials provider for a specific project. 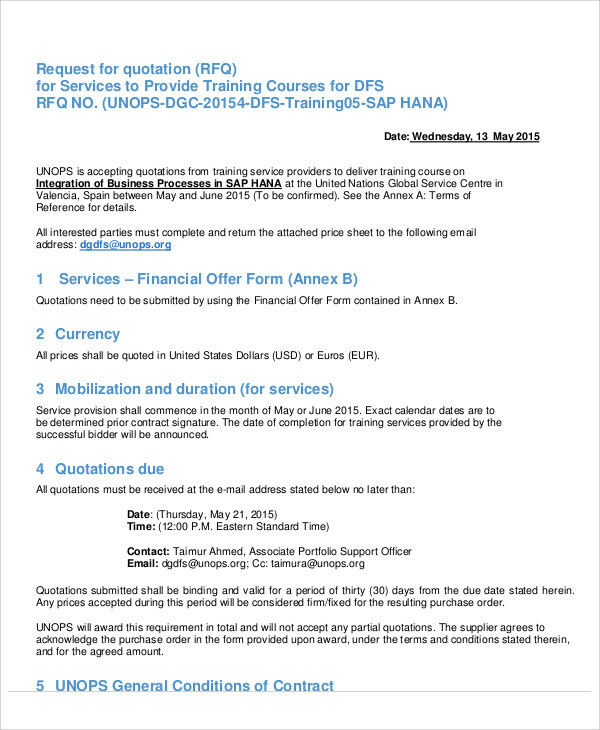 Follow the standard format and layout of official or professional letters. Observe rules on proper letter heading and formal greetings. Before mentioning anything else, immediately state the need that prodded you to seek particular products or services. For example, you can indicate that it is your dream to hold a bachelorette party in a spa center and that you require a full-day of pampering services for you and your guests. Indicate the items of product or services which you want to be priced. 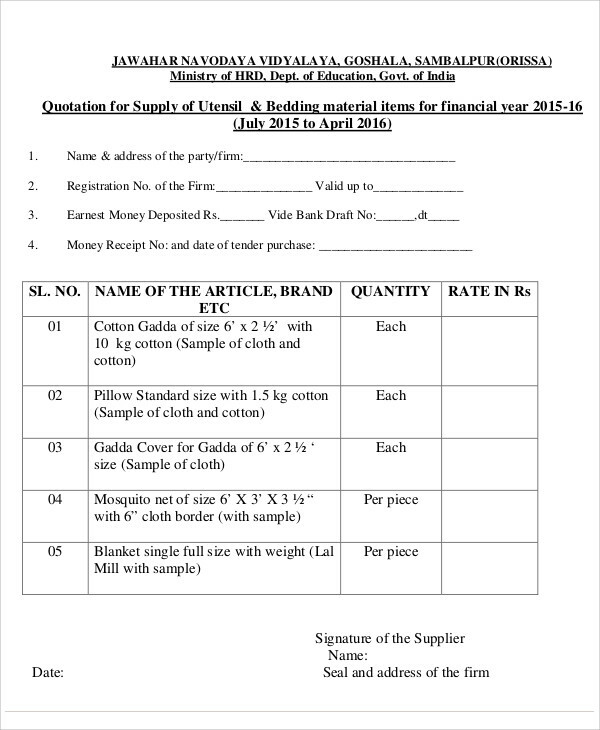 Ask for discounts by indicating the number of times you want to avail the product or service. 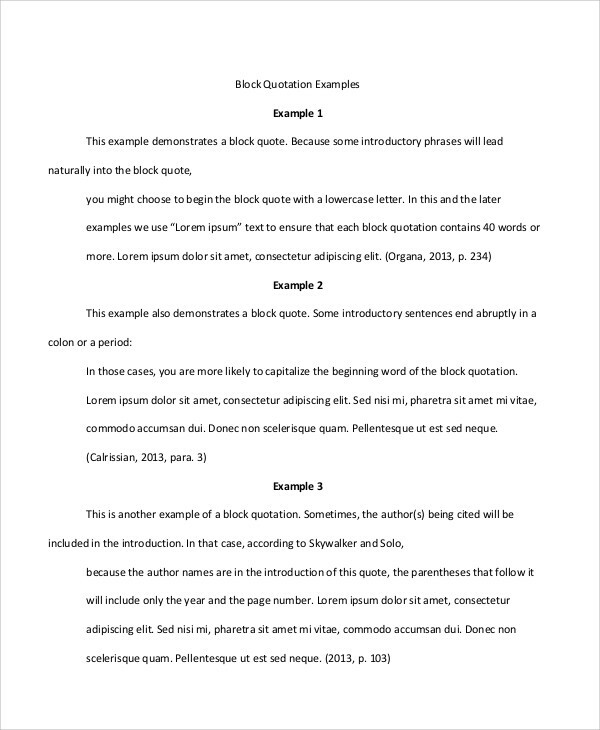 Now that you know the basics, go ahead and create your quotation proposal now! 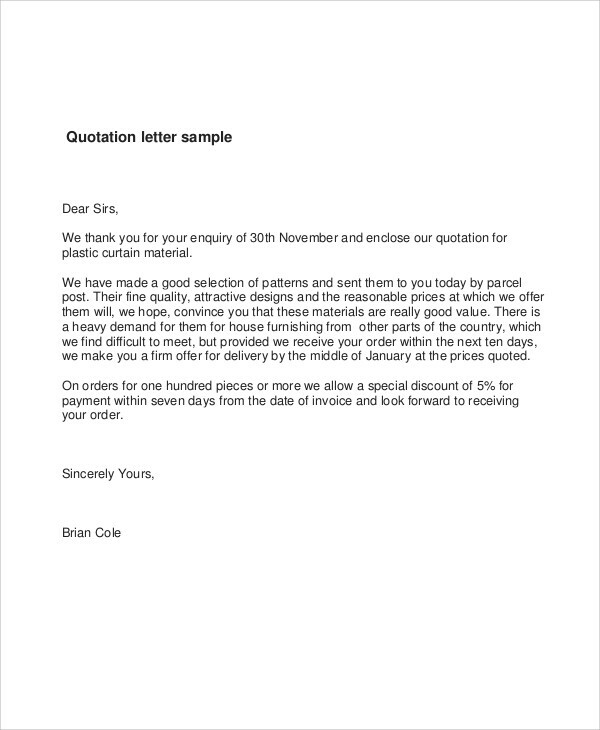 For more references, check out our Price Quotation Letter Samples. Simply click on the link provided.